A new Logging Fundamentals Training Program on Vancouver Island is helping to fill a growing labour gap created by the retirement of skilled workers. 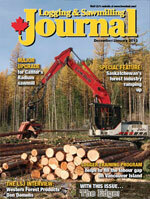 Western Forest Products is now the major player in the forest industry on the B.C. coast, being the region’s largest lumber producer. Company President Don Demens talks about Western Forest Products’ $125 million capital plan, making strategic investments in its facilities, including new autograding equipment. Canfor has reopened its operations at Radium Hot Springs, B.C., following a $38.5-million capital investment to upgrade the sawmill and build a new planer mill. When the mill is running at full capacity later this year, it’s expected to produce 240 million board feet annually. Access to quality wood fibre is giving Saskatchewan’s Edgewood Forest Products, which started operations in early 2012, the opportunity to produce higher quality products. Saskatchewan’s Dean Christensen has built a solid small sawmill business, and is now looking at expanding his product line beyond white spruce into birch and tamarack. A & A Logging feels fortunate to have survived the recent industry downturn, and is now considering what it needs equipment-wise to move into the future. Norrish Logging is sensing that stability is returning to Saskatchewan’s forest industry after a downturn that took its toll on the mills and contractors alike. Is remote command and control of logging equipment the way of the future? Columnist Tony Kryzanowski believes it is. A critical issue for many businesses are costs associated with supply chain management and that also holds true for both producers and potential end users of short rotation woody biomass. Recognizing the importance of this issue in making the business case to commercially grow and use short rotation woody biomass, the Canadian Wood Fibre Centre (CWFC) is conducting the largest operational demonstration ever held in Canada to investigate various mid-supply methods and issues associated with them. The goal is to determine realistic costs to harvest the woody fibre into round bales, transport them from the woodlot to the end use site, and costs associated with pre-processing the woody fibre for three different, energy-related, end uses. The sites where the woody biomass was harvested consist of first and second generation, purpose-grown, concentrated willow and hybrid poplar plantations comprising six to 10 clones per site in the Kemptville, Pickering and Guelph areas of Ontario. A total of 660 round bales, each weighing a third to a half a tonne, were harvested using an Anderson Group bio-baler. The three end uses CWFC is investigating for the fibre are: fuel to heat boilers at a large-scale, florist supply greenhouse; converting the fibre into bio-pyrolysis oil; and, using it as fuel to generate electricity. CWFC has partnered with a large nursery, the University of Guelph and CANMET Energy from Natural Resources Canada to evaluate the fibre’s value in each end use application. “Transportation, pre-conditioning and conversion are essentially the new pieces of the pie that we are addressing, to link the input costs associated with short rotation woody biomass production with recovery and value,” says Derek Sidders, Canadian Wood Fibre Centre (CWFC) Regional Coordinator for the Prairies. A key aspect of the mid-supply demonstration was to take a detailed look at the most cost-effective and safest forms of handling, transporting, and pre-conditioning the woody fibre and relating that cost to the designated end use of the fibre. Sidders says the final outcome of the demonstration will contribute to the enhancement of a biomass value simulation model that focuses on supply chain cost analysis. It will provide a guide for using short rotation woody biomass in various applications, attach costs to its recovery, and determine the economic effectiveness of various mid-supply management approaches. Woody biomass photos, from top to bottom: harvesting three-year-old willow; biobaler dropping bale; air drying bales; loading an open truck; transporting bales; grinding bales. American housing starts will return to historic levels soon, but pressure from home builders to reduce costs as lumber prices escalate will require Canada’s lumber producers to work more closely with upstream fabricators and distributors to help contractors build more efficiently. For example, this may result in greater demand for easy-to-assemble ‘job packs’ instead of individual sticks of lumber. Also, rising lumber costs plus the high cost of labor is forcing builders in areas like Alberta to consider more efficient building methods such as off-site fabrication and on-site assembly. This will require lumber producers to adjust their product mix, marketing, and distribution practices to fulfill this growing sector’s material needs. The question is how lumber producers should adjust their business models so that they can economically meet the changing needs of the building construction industry. Forest industry consultant Peter Woodbridge. 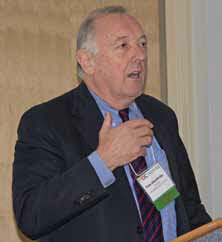 According to veteran forest and wood products industry consultant Peter Woodbridge, companies prepared to innovate by investigating and implementing new business models that provide builders with products that help them build with wood more efficiently stand to gain a very rewarding competitive advantage. Given the fallout from the recent housing collapse in the U.S., he adds that the timing to implement a new product mix and distribution model couldn’t be better. “The home builders’ backs are against the wall and they are looking at ways to drive costs to an efficient level,” Woodbridge said. He was among many experts who spoke at the recent Modular and Off-Site Construction Summit held in Edmonton. Alberta Innovates Bio Solutions (AI Bio) and many of Alberta’s major building construction companies sponsored the event. Some of the sponsoring companies have already made substantial investments in off-site residential building fabrication and are reaping the financial rewards because of the efficiencies gained over on-site residential construction. “AI Bio is attempting through research and innovation to assist Alberta wood producers and we believe that the boom and bust nature of sales of wood products can be dampened if we can develop new markets, new ‘green’ products and new construction techniques,” says Steve Price, Executive Director for Advancing the Bio-economy at Alberta Innovates Bio Solutions. Price adds that the wood industry needs to make a greater effort to incorporate products from the province’s abundant natural and urban forests into office buildings, public facilities and private residences. The Modular and Off-Site Construction Summit provided an excellent venue to explore all of these opportunities. Woodbridge, who has experience as a policy advisor on the forest industry to government, including the Alberta government, is president of forest industry and wood product consultants, Woodbridge Associates. He said that the economics and current business model of residential construction is still mired in the middle of the last century—on-site, stick-built construction where, “inefficiencies are the norm versus the exception”. Given the financial pressures being faced by home builders in the U.S. and in places like Alberta because of what consumers are prepared to pay—as well as the high cost of labor—those inefficiencies won’t be tolerated by home builders for much longer. They are looking specifically for cost savings in materials and labor because they represent about 50 per cent of their direct costs. While the wood products industry has tried to provide the building industry with modular components versus raw lumber in the past, Woodbridge said they only achieved marginal success. However, that was then and this is now. The current financial crunch being faced by homebuilders has created a more receptive environment for dialogue among builders, distributors, and lumber and building material suppliers to look at ways to help the construction industry build more efficiently. Given his knowledge dealing with the wood products industry and its expertise in harvesting wood and producing the raw material, Woodbridge said it is unlikely that primary lumber producers will want to invest directly in the technology to manufacture building material items like ‘job packs’. It is more likely that the economics would favor outsourcing this process close to the mill. The result is that there is definitely a new business opportunity for companies interested in providing this midstream, fabrication service to fill the gap between primary lumber producers and builders that use their products. The key is to streamline the distribution channel so that it is economical to deliver the job packs from the mill yard to the job site. “Because of what we can offer as an industry in Canada, I think it should be the building materials producers themselves that start to advance the argument,” said Woodbridge, “and I think they will find a very receptive audience in the construction industry.” He added that once the supply chain ‘job pack’ model is developed in North America, it can also be the model to sell product into other developing markets. For more information, contact Steve Price at steve.price@albertainnovates.ca or (780) 427-2567.